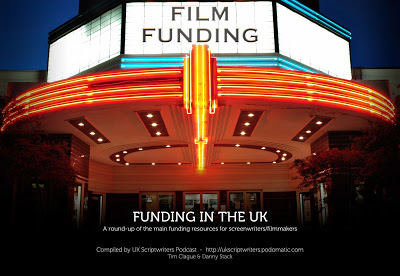 As per the recent UK Scriptwriters podcast, we've compiled a handy booklet that details all the film funding resources in the UK (and their relevant links). Best of all, you can download it for free HERE. Howevs, if you'd like to donate £1 (as a thanks for the booklet, or the podcast in general), then you can chip in via the Donate button below. Any kerjillions we make from the proceeds will go directly into paying for the podcast's ever-increasing bandwidth and our yearly subscription to Podomatic. Thanking-ew!